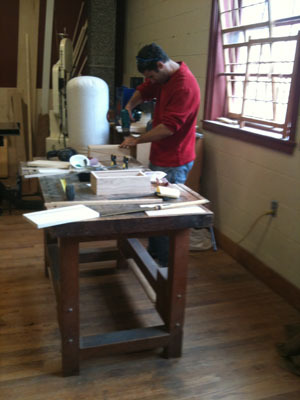 Before taking Fundamentals of Woodworking with Sabiha Mujtaba, I was a dabbler, a wannabe woodworker. I had a nice set of woodworking tools, but lacked the knowledge and skills to use them. And more than that, I lacked the confidence to say to myself “I want to build a new [insert woodworking project here]” and then go down to the shop and actually know how to proceed to build that project. I suppose I still don’t have all the steps down, but I got a lot closer this weekend. And the confidence I gained in Sabiha’s class is the big difference. 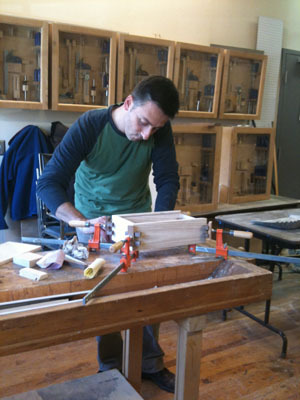 If you find yourself wondering how you can take that next step towards feeling comfortable and capable working wood, I would suggest looking up a fundamentals class. If you live in or near Atlanta or are willing to travel, take Sabiha’s next fundamentals class in March! After this weekend’s class, I am not only more confident, but I’m inspired and fired up to get into the shop and build something else. So what did we do on Sunday? Well, we finished what we started. At the end of the day on Saturday, we had glued up the walls of our boxes, so this morning our first order of business was unclamping the walls and basking in the pleasant surprise that everything stayed together. And then we sanded. And sanded and sanded and sanded. But you know what? 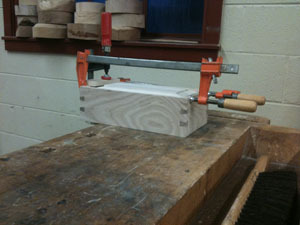 Even though this is one of the parts of woodworking that I’m not so fond of, it was actually quite satisfying. We used ash for the bulk of our project, and the grain sands really nicely. You see the results of your efforts fairly quickly, and it drives you to make it even better. Plus, the boxes were small, so it’s not like we needed to sand for hours. Kate, who superbly assisted Sabiha all weekend, cut the bottoms of our boxes and gave them to us to sand down a bit and fit into the rabbet edges at the bottom of our box walls. Then she helped us all do three passes on the router to shape the top of our box. 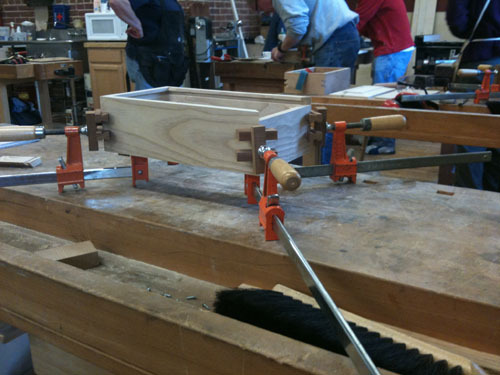 At the same time, we were passing our box walls through the other router to create the holes for the dovetail inserts to fit into the corners of our boxes, strengthening the wall joints. And in addition to those two tasks, we were fitting the lip of the box with a small insert to close it up and give an exact fit, and cutting it down to size with a handsaw. Did I mention it was a busy day? After a late break for lunch, we came back and fitted the dovetail inserts into the joints, then glued it all up and clamped it together yet again. This time we didn’t have another overnight to let the glue dry, so as soon as a sufficient amount of time had passed (or we got impatient) we unclamped, sawed the inserts off as flush as we comfortably could, and then pulled out a chisel and worked on improving our chiseling skills. My own chiseling skills are limited to a bit of clumsy work pulling paint up from a floor and chipping a whole bunch of edges on ‘practice projects’. 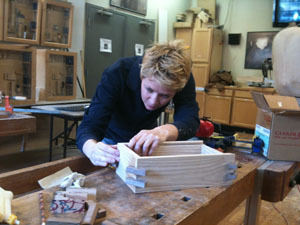 On each of our boxes we had two dovetail inserts in every corner to chisel down as flush to the boxes edge as possible, so I had a lot of real practice, with smart instructors standing beside me, to learn a few different techniques. By the end I still wasn’t that close to ‘good’, but I felt a lot less bumbling, and quite a bit less likely to injure myself. 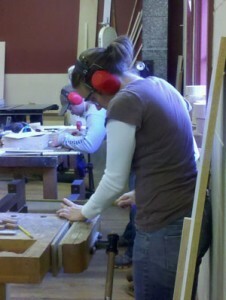 Denice fitting her dovetail inserts. And finally, the piece de resistance: fitting the top in. We glued the front lip onto the lid, slid it in, clamped it all down one more time while we cleaned up the shop, and amazingly enough, when we unclamped them, we all had a working sliding-top box, with lots of new skills nestled inside. 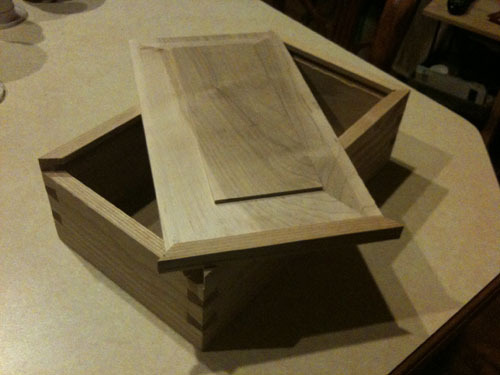 Besides a pretty cool looking box and a whole resume’s worth of new skills to build on, the other thing that I really gained from taking this class was an appreciation for my fellow beginner woodworkers. It was a great group of people, all very supportive of each other, and it made me feel closer to the woodworking community as a whole. The finished projects and the fun process of building them are definitely reasons to try woodworking yourself, but the good people who we get to work with in our craft are a great reason to keep doing it. 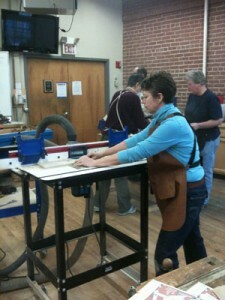 Thanks to everyone in the class, to Sabiha and Kate, and to Highland Woodworking for hosting. Complete. Except maybe a bit more sanding. Excellent work! I’m taking the same class this weekend. Can’t wait. Thanks Keith! You are going to have a great time in that class – Sabiha is an excellent teacher. Have fun!